Inspired by Dave Parry, my friend Andrew said: “We are no longer just seeing the power of the public internet. We are now seeing the rise of the internet public.” It was a bit of an ‘aha!’ moment for me. 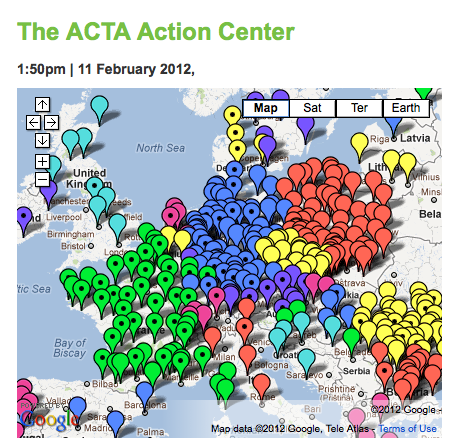 It’s been amazing to watch the push back against SOPA in the US and ACTA in Europe over the past few months. And, of course, to have witnessed the Arab Spring. The people behind these events didn’t just use the internet to amplify voices: they were the voice of the internet speaking. And, at least with SOPA and ACTA, the message itself was about the internet and what it stands for. This is new. And good. I’ve always believed the internet is something special. Not just something to use and build on, but also something to stand up for. As Joi Ito said in the New York Times a couple of months back: “The Internet isn’t really a technology. It’s a belief system, a philosophy about the effectiveness of decentralized, bottom-up innovation.” This vision of the internet has motivated me for a very long time. It’s what brought me to Mozilla. Until recently, it felt like the group of people who cared about the Internet as philosophy was relatively small. I personally know hundreds of people who spend every day evangelizing the open ethos of the internet. I’m one of them. The thing is: none of us have had much luck getting sizeable numbers of people excited or engaged. We’ve all tried. But the idea of an ‘open web’ or ‘internet ethos’ has always been too abstract get people to prick up their ears. This seems to be changing. We are seeing the rise of the internet public: a movement or constituency that is both of the internet and about the internet. The Facebook signs in Tahrir Square were a first glimpse of this. In some ways, these signs were a small footnote in a bigger political change in the Arab world. But they also point to the fact that the internet is more than just a part of the story — it is itself a story to pay attention to. The massive public push back on SOPA and ACTA show this more starkly: there is a broad public passion for and connection to the internet. People are saying: ‘the open internet and the way it connects us is a central part of the world we want to build.’ In this story, the internet isn’t only a disruptive tool that helps bring about democracy where it doesn’t exist, it’s also represents a vision of decentralized, bottom up society in it’s own right. This part that feels new and different. ‘The internet as philosophy’ no longer feels so abstract. As an example of how things have gotten more concrete, the internet public has quickly and dramatically changed the discussion on both SOPA and ACTA. Both seemed destined for quiet approval just a few months ago, now SOPA seems to be dead or ACTA is under extreme public scrutiny. Note what’s happening here: the leaders of a major economic power are espousing the importance of an open internet. They are also calling out the protection of a key technical building block upon which the open platform and philosophy of the internet are built. Similar things have happened in Europe around ACTA. This is both important and unprecedented. At Mozilla, we’ve been talking about what to do next on SOPA and ACTA. This is important. But I believe there is a bigger question: how can Mozilla fuel, bolster, cheer on and be a part of this rising internet public? The world we’ve imagined may be just around the corner: a world where the ethos of the web is a conscious part of how huge numbers of people approach their lives, their work and their government. This is a the world I want to live in. I’m going to think and write about all this some more. Partly in the context of SOPA and ACTA. But also in relation to building a more web-literate society — teaching tens of millions more people how the web works and how to code. Any thoughts you’ve got would help. PS. A tip of the hat to Dave Parry for his ‘It’s not the Public Internet, It is the Internet Public.‘ post. I’ve gone in a slightly different direction, hopefully in a way that’s complimentary . One Web Day + Drumbeat = Great! 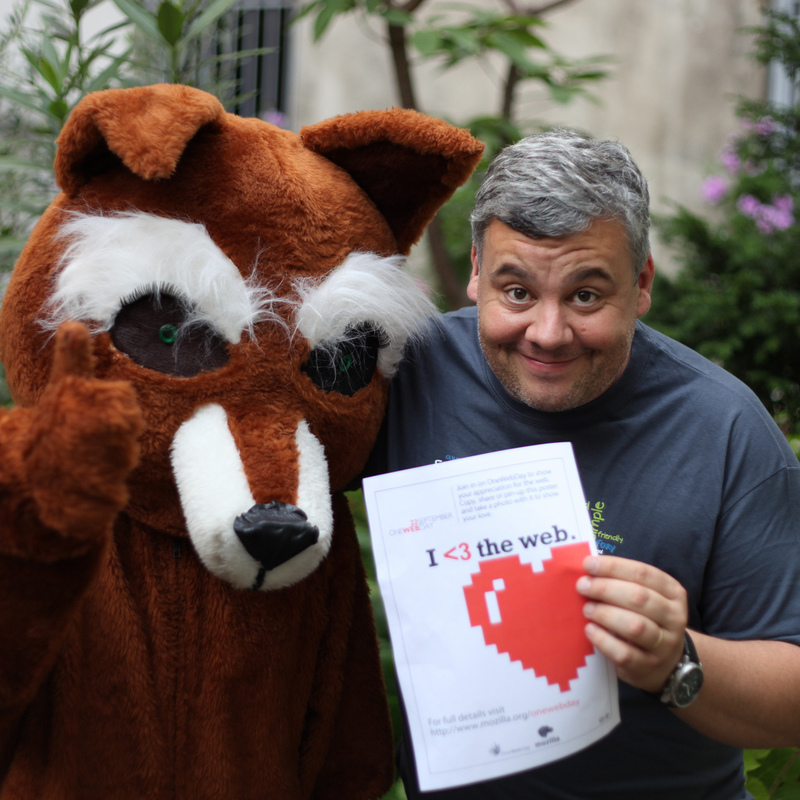 I’m excited to announce that OneWebDay.org is joining forces with Mozilla Drumbeat. As Nathan blogged today, both organizations share a common cause: improving and protecting the open nature of the internet. We believe the best way to promote this cause is by working together. There will no longer be a single, centrally organized One Web Day in September. Instead, the focus will be on open web projects that take place year round under the Drumbeat umbrella. Personally, I’ve been impressed by the diverse and energetic community that One Web Day has created. One example: last year’s Toronto put me in touch with all sorts of people who I’d never seen at other local internet events. Artists. Designers. Photographers. Social activists. People who care about the open internet, but hadn’t yet found a way participate in making it better and stronger. These are exactly the kind of people we want involved in the practical projects and events that make up Drumbeat. Building on this spirit, I invite anyone who has organized, volunteered or participated in One Web Day to get involved in Drumbeat. There are simple ways to do this: sign up on the site (we’ll be in touch) or make a donation (this will help us fund Drumbeat projects). There are also clear paths to getting involved at a deeper level right away: organize local a Drumbeat event in your city or propose Drumbeat project. We’re still at the very beginning of building Mozilla Drumbeat — I can imagine no one better than past One Web Day organizers to help shape and define what Drumbeat becomes. PS. Nathan and I will be holding open conference calls over the next week for One Web Day organizers interested in getting involved in Drumbeat. Alternately, you can just introduce yourself as an OWD person in the Drumbeat organizers discussion forum. Happy One Web Day! I <3 web wave rolling. I woke up this morning to a feed reader full of I ❤ the web photos from India. Got to the office: a bunch more from Europe. And a video from Toronto. Today is OneWebDay. And, slowly, a wave of celebration for the web is rolling around the world. 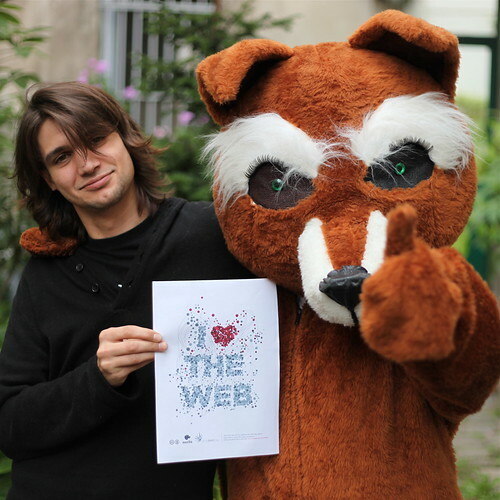 Why take the time to say ‘I love the web’? My reason: I believe it is worth stopping to remember that the web is not only a huge source of creativity, innovation and wonder, but it’s also something all of us help create everyday. The web may feel like oxygen, just there all the time. But it is oxygen that we all help to make. OneWebDay is about taking a moment once a year celebrate the (better and open) web we’re all creating. Yale Students for Free Culture start the wave during Service Week. Many people decide to keep it digital. It even shows up in Second Life. Finally: seems like this fox love the web. Happy OneWebDay all. And make sure to join the wave by posting a photo or changing your twitter, identi.ca or facebook icon. Love the web. Share the love. Love the web? Poster. Picture. Pass it on. 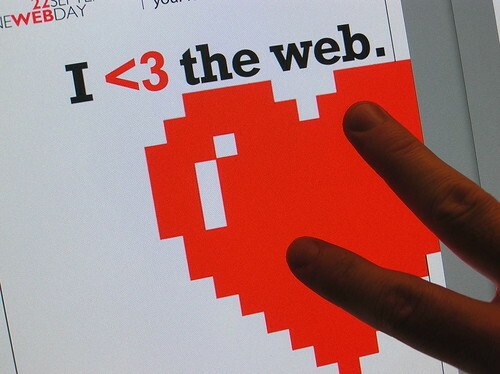 Leading up to next Tuesday’s OneWebDay celebrations, we want to send a wave around the world that says: I LOVE THE WEB. How? By asking people everywhere to pin-up and photograph themselves with OneWebDay posters. This post provides simple instructions on how to join the wave. You can pick and download the posters at www.mozilla.org/onewebday. Put your poster up at your desk, a local cafe or the window of your house. Anywhere prominent. And then snap your picture. The easiest thing to do is put your photo on Flickr with the #owdposter tag. 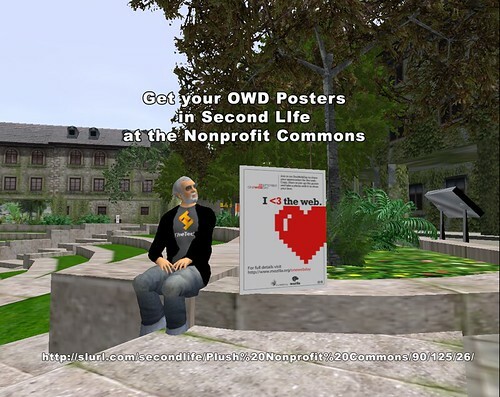 Other options include tweeting your photo using the #owdposter tag or just posting on your own web page. … by joining our OneWebDay photo contest. You can win a Firefox laptop bag if you’re selected as best photo. The contest is at www.mozilla.org/onewebday. 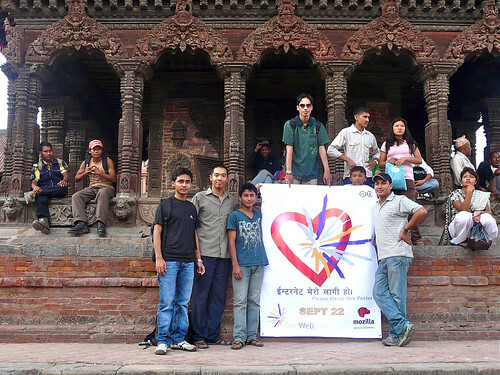 Tweet, blog or email your friends to share your photo and invite them to love the web. OneWebDay exists to celebrate the awesomeness of the internet. It’s also an chance to remind people that the web is a precious public resources. Your poster and photograph are a part of this. When you poster, you’re helping to keep the web open and free. You are currently browsing the onewebday category at commonspace.